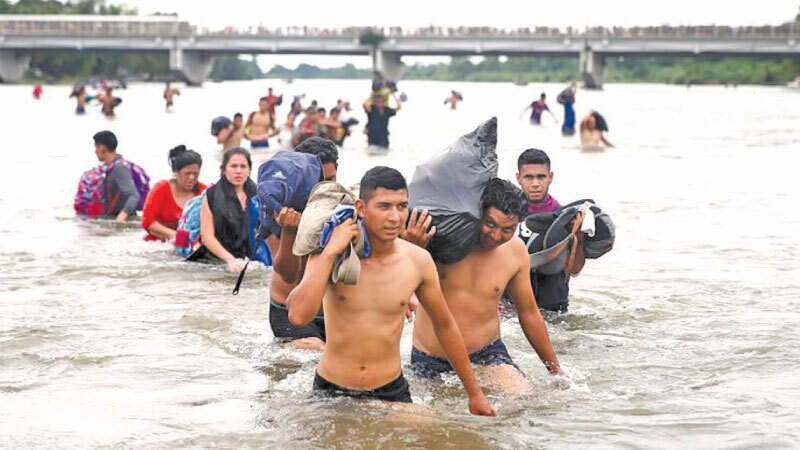 Central American migrants, part of a caravan trying to reach the US cross the Suchiate River to avoid the border checkpoint in Ciudad Hidalgo, Mexico on Monday. US: US President Donald Trump said Monday his administration was planning to build tent cities for thousands of Central American migrants making their way through Mexico to the United States. The announcement during a Fox News interview came as the Pentagon announced it was deploying 5,200 active-duty troops to beef up security, and follows weeks of heated anti-migrant rhetoric from the president ahead of crucial midterm congressional elections next week. “If they apply for asylum, we’re going to hold them until such time as their trial takes place. We’re going to hold them, we’re going to build tent cities, we’re gonna build tents all over the place. “We’re not gonna build structures and spend all of these hundreds of millions of dollars. We’re gonna have tents, they’re gonna be very nice, and they’re going to wait, and if they don’t get asylum they get out.” He added that asylum seekers would remain in detention while their claims were being processed, a move which he said would deter would-be applicants from coming to the US. “If you wanna wait, they don’t usually get asylum. You know that. The problem is they release them in and then they have the trial, three years later, and nobody shows up. “But we are gonna, unlike Obama and unlike others, we’re going to take the people, we’re going to put them in, and they’re gonna wait. “When people find out that happens, you’re gonna have far fewer people come up.” Trump has been campaigning intensively for weeks, frequently hammering on the migrant caravan issue and stoking anti-immigrant concerns among voters.